I thought I was all ready to move on to the railway station in Madgaon to move on to Kochi by overnight train, but then I had a reminder in the form of a comment that I hadn’t mentioned the old churches in Goa yet. Upon reviewing my photo-file, I decided it was worth a slight backtrack to include some of those, since churches are so prominent in Goa. From searches online I counted nineteen in north Goa alone, and another three in the south. There may very well be more, and though it seemed at times that we visited them all, it would have been impossible with the four days we spent there. 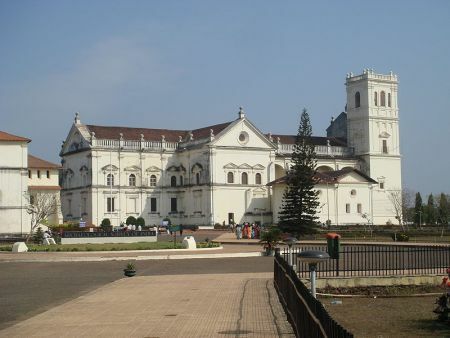 Goa’s churches are a prominent, remaining heritage of Portuguese colonization. Like Columbus, Portuguese explorers were looking for spices, but they kept an eye out as well for possible easy converts to Christianity. They began seizing and occupying former Hindu temples, replacing them with churches. In a familiar story of early conquest and colonization and religious conversion, the Portuguese more or less forced Christianity on the people of Goa until the official end of the Goan Inquisition in 1812. Church building became one of the major occupations of the early Portuguese settlers. 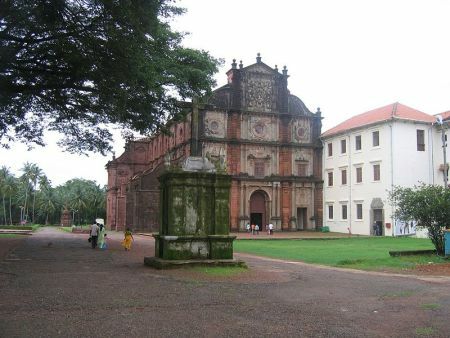 I covered the Basilica of Bom Jesus (below) in a previous post (June 24, 2010) in west meets east in picture perfect goa monsoon. If you missed it you can use one of these links. It’s the church that contains the body of St. Francis Xavier, a member of the Society of Jesus who came to India with the Portuguese to spread Christianity in India. 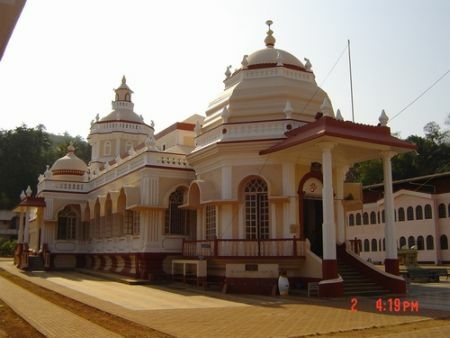 He is often credited for preaching the teachings of Jesus and baptizing various people in Goa. This is the front entrance to the Basilica. Formerly on this spot (below) stood a gate through which it is believed that Alfonso de Albuquerque entered the old city of Goa in 1510. The walkway is full on both sides of lush tropical trees and impressive buildings like this, the Chapel of St. Catherine. The sun had begun beating down on us by the time we headed off to see the Mangeshi Temple on our itinerary. 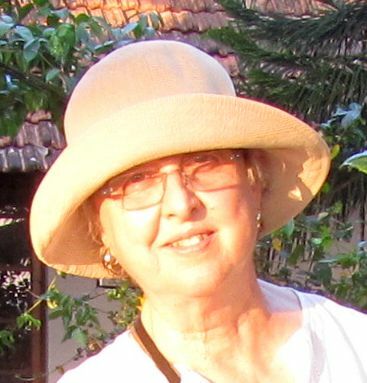 I noticed our friend ML had remembered to pack her sunhat for India. I, alas, had not. As it was getting hotter and hotter as the rose to midday position high over, I decided it was time to buy a hat–even though I had several great sunhats back home. This is the hat I found in a market as we walked to the temple (missing from both my memory and photo-file). I usually have a lot of trouble choosing hats, and being in a hurry Hubby picked up and held out a couple for me to consider. I declined them all–as yuk! horrible color, horrible shape, too masculine, too something or other! The lady hat vendor who had been watching me proffered her choice. Voila! It was the perfect hat that I never knew I wanted until she produced it. (I should hire her to be my personal shopper.) 90 rupees she announced. Hubby, to show how American he’s become when it comes to buying things, simply produced the money and paid for it–probably relieved at my quick choice. Our shopping adviser for this leg of our trip, my brother-in-law’s wife Vasanthi, rushed to protest too much! By then it was too late, and I was wearing a hat that cost about two U.S. dollars. Seems we should have been able to buy it for about half that. From here I continue the tale with confidence only because of the backup of Hubby’s and his brother’s memories, and therein lies another tale. Yesterday I must have argued with Hubby for half an hour at least! No, we never went in that temple! I would have remembered a beautiful building like that! Out of all the thousands of pictures I took, how could I possibly have failed to photograph this one? Even if we weren’t allowed photographing inside, I wouldn’t have missed an outside shot! How could I? Never! It’s not that I hate to be wrong, I just hate it when Hubby is so often right! Before I would concede, I shot off an email to Raj and Vasanthi in India. This morning their reply was in our email. It goes: “Yes, we did visit the temple. We all walked some distance from the parking lot in 11 o’clock heat to reach the temple. All of us washed our feet before entering the main part.” Clearly, with so much detail, I finally had to admit–Hubby was right–again! Mea culpa. I now ask you, how in heaven’s name could I forget visiting this beautiful temple!? Mangeshi is an incarnation of the Hindu deity, Lord Shiva (the destroyer). The picture is courtesy of Wikipedia Commons Attribution. If I ever get there again, I’ll take my own! I admit that seeing a succession of ancient (to me) temples and churches does present a challenge in trying to distinguish one from another with the passage of time. Thank goodness I have the memories of my fellow travelers to fall back on. Now I’m pulling the plug to rest my brain lest it experience a similar incidence. And I’ll get ready to review the next phase of our journey–yes, the second class train–to Cochin (or Kochi). This entry was posted in International Travel and tagged Arabian Sea, Asia, Bom Jesus Basilica, Calangute, Francis Xavier, Goa, India, Vagator by Alice. Bookmark the permalink. I love the hat! The temples & churches seem enormous even by Irish standards but they do have character to them. Oh that they do have–character–and a lot of riches invested in each. Thanks about the hat. I’m looking forward to wearing it again when it gets sunny again–and warm–in SLC! The first thing I noticed was the hat before I knew that some of this was about the hat – love it. The next is about memory and what I’ve learned. This isn’t just a case of getting older because actually I read recently that we lose a bunch of brain cells is rather a myth about old age and memory. My lesson has been that I remember what I choose to – and that I have an inordinate amount of trouble with names. You could tell me your name is Alice till the cows come home but unless I make that first zing connection, I will call you Ruth or Jerilee for no reason whatsoever other than that is what I named you in my mind when I first saw you. On remembering where I have been and what I did, I find that somedays more than I care to admit I cannot remember what I did yesterday afternoon. Why is that? I blame it on all the larger questions that my mind is unraveling at a clip and so like Einstein was purported to have said, don’t remember anything you can look up. So with Hubby there to be your own personal Wikipedia, why bother.